The Coveside Assembled Barred Owl House is the perfect nesting and roosting spot for these large owls. Barred owls are one of the few varieties that take to a nesting box. This box features drainage holes in the floor and a slanted roof to keep the interior dry. Holes in the sides of the house provide ventilation and keep the temperature down so as not to harm owlets. 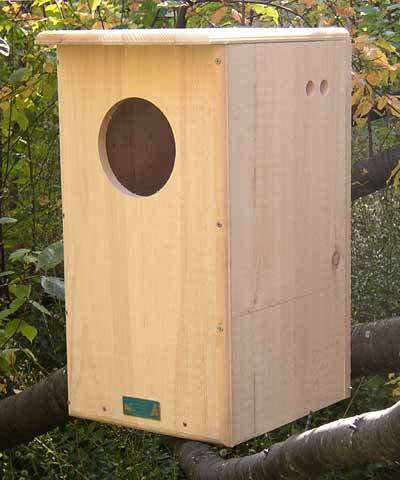 A latched side panel allows you to observe your nesting owls and clean up after them when they are gone. Mount the Barred Owl House high up in a tree for these common owls. Use the included nails and pre-drilled holes to attach the roof of the house. Celebrate birds of prey in your forest with this Assembled Barred Owl House. Handcrafted in the USA.